*This episode of Knight Rider, "Lost Knight," premiered Sunday, December 9, 1984, on the National Broadcasting Company television network. *Glen Larson created many series in addition to this one, including Quincy, The Fall Guy, Buck Rogers, and many others, and he also had a hand in previous BOTNS-spotlighted Magnum P.I. *The series' theme song, which has the appropriate title "Knight Rider Theme," is credited to Larson and composer Stu Phillips, who also created the theme for Battlestar Galactica and produced Shelley Fabares' hit "Johnny Angel," a fact that fascinates me for some reason. *The Garthe Knight (the actual son of wealthy industrialist Wilton Knight) episodes are "Goliath" (Season 2, Episode 1) and "Goliath Returns" (Season 2, Episode 17). *The K.A.R.R. (Knight Automated Roving Robot)--the evil counterpart of K.I.T.T. (Knight Industries Two Thousand) episodes are "Trust Doesn't Rust" (Season 1, Episode 9) and "K.I.T.T. vs. K.A.R.R." (Season 3, Episode 6). By the way, shouldn't that first episode be called 'Trust DON'T Rust"? Much cooler title. 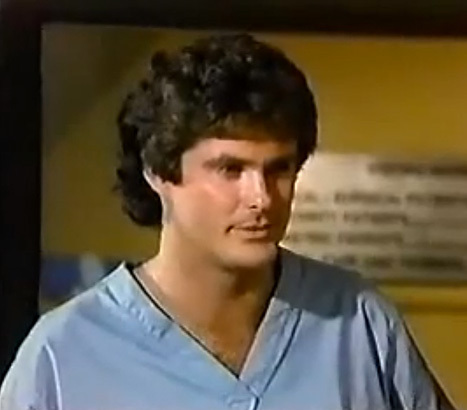 *Hasselhoff's big break was on The Young and the Restless, not General Hospital, though he did play a doctor--Dr. SNAPPER FOSTER! *Caribbean Queen (No More Love on the Run) was a smash hit for Billy Ocean, reaching #1 on the Billboard singles chart in 1984. *Doug's mom in this episode is played by Lenore Kasdorf (who, we confirm, is not Dawn Wells). *The Hassslehoff appearance on Diff'rent Strokes occurs in that show's sixth season's "Hooray for Hollywood Part 1," which also features the first appearance of Sam! *Check our YouTube channel for this episode's playlist, which includes a sweet custom Knight Rider pinball machine in action.